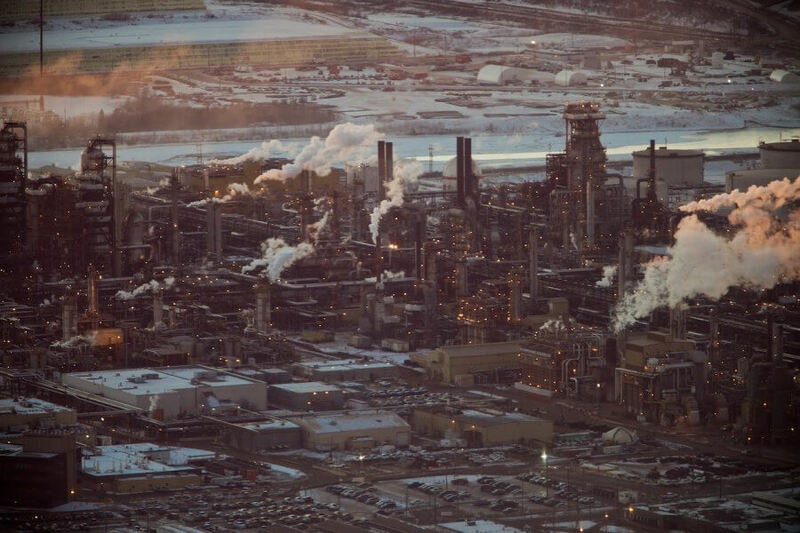 Page title: Environmental Disaster Is Canada’s New Normal. Are We Ready? Mike johnson, the emergency-management coordinator for Cumberland County, Nova Scotia, is a man on a deadline. He has sixteen years before the moon and the Earth align and produce an exceptionally high tide, an astronomical “king tide,” in his county. Some things about that day are a certainty. He knows that the tides at the head of the Bay of Fundy, where Nova Scotia is connected to New Brunswick by the twenty-four-kilometre-wide Chignecto Isthmus, rise as much as sixteen metres—the largest on earth. And he knows that a series of earthen dikes is all that stands as a defence against catastrophic flooding. The last time such a large king tide hit, in 2015, Johnson stood on the banks of the Tantramar Marshes, as sixty-kilometre-per-hour winds spat ocean spray into his face, and watched the sea nearly overtop the dikes. There was a fifty-centimetre storm surge that day, a result of the ocean bulging from a low-pressure system nearby, which, together with high winds, compounded the tide’s high-water mark. The normally pastoral landscape was already partly flooded with seawater. As he turned back toward his car, he saw a CN train cautiously making its way along the tracks that run atop the dike. The water was nipping at the railway ties. He could see headlights of cars, driving along the Trans-Canada Highway behind the train, oblivious to the fact that a hand’s length of dike was all that held back the ocean from pouring onto the highway, flooding the isthmus, and effectively turning Nova Scotia into an island. Johnson knew then that it wouldn’t take much more for disaster to strike. When it does, Johnson’s priority will be to save lives by evacuating the area. But depending on the severity of flooding, a lot more is at stake. Some $50 million of goods course through that highway and rail line every day. Predictions show that by the next king tide, the ocean will have gained another 7.5 centimetres or more on the dikes due to a combination of sea-level rise from climate change and the land naturally sinking—rendering the dikes useless in a similar storm surge. Nine hundred kilometres away from the mud-marsh dikes of the Chignecto Isthmus, staff at the federal Office of the Auditor General in Ottawa are two weeks away from tabling an unprecedented collaborative report on the state of climate change action and preparedness in Canada. The gentle sounds of typing, mouse clicks, and overhead fans float above the cubicles. On the face of it, the stillness of the toil within the impassive office couldn’t seem further from the drama on Mike Johnson’s horizon, but the work at the office has everything to do with the rising seas gaining on Cumberland County’s dikes. Their nationwide assessment will tell us just how insufficiently governments across Canada are serving us as we enter this age of climate instability and how and where they all need to pick up the slack. “Climate change is one of the biggest issues that we are facing this century,” says federal commissioner of the environment and sustainable development Julie Gelfand, whose office coordinated the audit. “We are feeling the effects already, and they are having an impact.” Since 1948, Canada has warmed by 1.6 degrees, twice the global rate, with our western and northern regions warming the most. Already, we have evacuated an entire city as it burned (Fort McMurray’s “the Beast” destroyed 2,400 homes and 18,600 cars), witnessed landscapes transform (permafrost is currently thawing at least 136,000 square kilometres of Canada’s tundra, causing massive landslides and sinkholes), and seen geopolitics shift on our doorstep (the Chinese icebreaker Snow Dragon traversed the Northwest Passage last year in the initial push to build a “Polar Silk Road” as Arctic sea ice retreats). Of all the hazards that climate change brings to us more frequently and ferociously—wildfires, drought, permafrost melt, disease—flooding poses the biggest risk to the most Canadians, endangering some 1.7 million households. For every degree of warming, the air can hold 7 percent more moisture—which means that as precipitation increases, so does its intensity. No entities in Canada carry greater responsibility for how to handle these changes than our federal and provincial governments. The government of Canada is the biggest landowner and largest employer in the country, with tangible capital assets worth approximately $66 billion, and its job is to ensure the very fabric that holds our country together and keeps us safe—our health care, our highways, our airports, our infrastructure, our defence—will continue to function in the face of climate change. Only government can put the policy instruments in place, be they carrots or sticks, to meet our international emission-reduction targets and bankroll massive infrastructure upgrades. The task of holding governments to account falls to our auditors general, who don’t comment on the merits of policy but rather determine whether policy has been effectively implemented and, if not, make recommendations on how to close the gap between words and action. At a time when public trust in government is at a seventeen-year low, the same independent government watchdogs that outed the sponsorship scandal that precipitated the demise of Paul Martin’s Liberal government, called out the Canada Revenue Agency’s chronic inability to answer calls from taxpayers, shamed the Ontario Ministry of Health for its cancer-surgery wait times, and flagged the Alberta government’s nugatory multi-billion-dollar class-size-reduction program turned their unflinching gaze to climate change. “In the post-truth world that we’re living in, I would argue that our audits are as close to the truth as you can get,” says Gelfand. She is effusive and candid, with a laugh that cuts through the tension of the moment. At the Canadian Council of Legislative Auditors’ spring general meeting in 2015, Gelfand, two years into her seven-year term as federal commissioner, was pleased to see the council decide to audit one issue together, something it had never done before. For the first time in Canadian history, not only did auditors general across the country agree to audit the same topic but the topic they chose was climate change. Shortly after, notifications began to go out to federal agencies across Canada, nine provinces (Quebec had already tabled two reports related to climate change with a third underway, so it was agreed it would be a partner not a participant), and the three territories. The collaborative audit encompassed a total of nineteen federal departments, dozens of provincial departments, Crown energy corporations, and hundreds of municipalities in an unprecedented effort meant put the entire country on the same page. Kimberley Leach, principal at the Office of the Auditor General and de facto manager of the climate-change auditing project, is the perfect foil to Gelfand’s Oprah-like enthusiasm, with her quiet speech and equanimity. A civil servant so low profile that she has no LinkedIn page, Leach has been chief draftsperson behind many of the commissioner’s heaviest-hitting audits in recent years. “Our world is increasingly interdependent, so I think collaborative auditing is both a reaction and a way forward on that,” she says. Over her career, she has come to know all too well that examining one jurisdiction at a time would never be enough, given the patchwork of policies on climate change across the country. “We can look at the federal regime, provinces can look at their own regimes, but what is the overall picture? That was our mission, to be able to put together those pieces,” she says. Each auditor general was responsible for tabling a climate change audit at its legislature that would then be synthesized into a big-picture report with the Ottawa team. The auditors examined two facets of climate change for each of their jurisdictions: where their government stood relative to their greenhouse-gas-emission-reduction targets and how well they were adapting in the face of climate change. On the climate front, mitigation and adaptation are inextricably linked. Because our greenhouse-gas emissions are cranking up the Earth’s thermostat, the more carbon dioxide and methane we produce, the warmer the planet gets and the greater the changes we will face. The more we reduce our greenhouse-gas emissions, the less steep the incline to overcome. Any policy area where government had committed to climate change action was fair game, and on this topic, our governments have promised a lot. They have committed to reducing our greenhouse gases many, many times. They have set deadlines for emission reductions that they’ve consistently missed. Over the last twenty-two years, Canadians have seen four different federal governments hatch seven different climate change plans, and all the while, our emissions keep rising. According to the Parliamentary Budget Office projections in 2016, Canadian emissions would need to fall by 208 million tonnes of CO2 (or equivalent of other gases) to meet our 2030 target set in the Paris Agreement. As the PBO points out, this is the equivalent of taking every single car, truck, and ATV in Canada off the road. In short, we are off by a lot. The current national political discourse on climate change focuses on win-win scenarios: we can have our economy and our environment too. We can build pipelines as well as tax carbon. And that may be. Canada’s GDP long ago decoupled from our carbon dioxide emissions. We generate more economy while polluting less than we ever used to. But the reality is that climate change won’t be win-win for everyone. The National Round Table on the Environment and the Economy estimated in 2011 that by 2050 climate change will cost Canada between $21 billion and $43 billion a year. At the upper end, that’s the equivalent of just under one-third of all the federal personal-income tax collected in Canada last year. Insurance payouts in Canada for extreme weather have already skyrocketed in recent decades, to $1 billion a year, and the federal fund that helps provinces and territories recover from natural disasters doled out more money in the six years leading up to 2015 than in the previous thirty-nine fiscal years combined. If the environment and the economy go so tightly hand in hand, then what does it say when our environment is costing our economy and citizens so dearly? With two weeks to go, the Office of the Auditor General in Ottawa is sombre and earnest, with its beige walls and monthly “enviro tips” that rotate on a flat screen by the staff entry: pick up some litter and reuse your eggs cartons for craft projects, they suggest. Canada sees itself as a climate-forward country—environmentally aware, conscious, and active. The collaborative audit will tell us if that’s true and whether our gaze is sufficiently focused on the not-so-distant and somewhat terrifying horizon. On June 16, 2016, approximately 130 millimetres of rain fell on Chetwynd, a small town in northeastern British Columbia. The amount it received in that one day was more than one-quarter of the total rain that falls on the town in a typical year. Mary Jane Barton and her husband live twenty-seven kilometres west of Chetwynd in a small rural community called Hasler Flat, nestled against the foothills of the Rockies. The Bartons were lucky. The Pine River rose up gently to flood their property, sort of like backwater. But their neighbours’ experience was a different story. A small creek runs through their lot, something you could cross by foot and emerge from with damp shoes. That day, the creek changed beyond recognition. It wasn’t just the volume of water that was terrifying—with it came dump trucks’ worth of gravel and rocks that hurtled down with unstoppable force. “It came down like a giant snowplow,” says Barton. At one point, she looked out the window of her upstairs bedroom to see a neighbour’s white camper trailer being carried away in the torrent. “It looked just like a white Styrofoam cup bobbing in water, and away it went,” she says. The downpour felled power and phone lines, undermined a section of rail tracks, exposed two pipelines, and washed out the highway in both directions, stranding the Bartons and some forty other families in the area for nine days. They had no power, no phones, and no way out, because they were unable to get past what she calls “the Bowl,” a thirty-metre-wide, twenty-five-metre-deep hole in the highway. Four months later, Katie Olthuis, an auditor at the BC Office of the Auditor General, visited the same stretch of highway. The flood waters had long receded, but signs of their destructive force remained. “You wouldn’t think that water could take apart metal, but it really looked like it could,” she says, recalling the sight of culvert pipes that the water and debris had torn apart. Olthuis had come to Chetwynd to see what adaptation would mean for the BC Ministry of Transportation and Infrastructure, which is responsible for maintaining and upgrading the province’s highways. During the flood, many of the culverts that ran under the highway were unable to divert the massive volumes of rainwater. The result was a giant whirlpool that carved a crater in the road. The BC Ministry of Transportation and Infrastructure had recently updated its standards to accommodate spikes in precipitation that are expected to swell waterways as a result of climate change. Ministry workers were there to assess damage, but they were also rebuilding with a view to climate-change-proof the highway. The width of culverts under roads or the amount of rip-rap positioned to stave off erosion—these are the details that make the difference between an intact road and a washed-out highway that leaves forty families stranded and relying on helicopter drops of propane. The examination phase of a performance audit typically involves grinding away on gargantuan files with auditing software, but the BC audit team wanted to see climate adaptation for itself. “There’s a lot of public discussion around mitigation,” says Carol Bellringer, auditor general of British Columbia. “I think there’s less conversation, and there should be more around what is being done on adaptation.” BC faces increased risk of drought, flood, and forest fire, and Bellringer and her team saw an opportunity to provide value to British Columbians, more than 65,000 of whom were evacuated last year during the province’s worst wildfire season on record, by making recommendations to government on how to improve its climate resiliency. By the time Bellringer tabled her province’s climate change audit in mid-February, Ontario, Saskatchewan, Manitoba, Newfoundland and Labrador, Prince Edward Island, New Brunswick, the Yukon, the Northwest Territories, and Nova Scotia had already tabled their individual reports, with only Alberta and Nunavut outstanding. Gelfand had tabled her federal climate change audit report in late 2017, which, among other revelations, noted that fourteen out of nineteen federal departments had not fully assessed their climate change risks. Cumulatively, the federal, provincial, and territorial audits began painting a grim picture of Canada’s climate-change preparedness across the board. How could Environment and Climate Change Canada ensure continued weather forecasts if it hadn’t assessed the risks that climate change poses to its very own weather stations? How could Manitoba’s former NDP government know in 2009 that it wouldn’t be able to meet the emissions targets it set in 2008 but do nothing for another six years? And how could the Northwest Territories’ Department of Infrastructure lack a formal climate-adaptation plan for public buildings that could be structurally compromised from melting permafrost? As the list of indictments rolled in to the environmental commissioner’s office in Ottawa, the team summarized and tabulated the observations from around the country. Each individual audit was key for the single summary report to show a cross-Canada picture. After all, if the auditors general couldn’t get on the same page on climate change, what hope did the provinces and feds have of coordinating efforts to actually do something about it? Climate initiatives run big bills, mobilize vast resources, and affect millions of lives. The audit identified a consistent lack of feedback and reporting mechanisms in place to tell us what we’re getting for these investments of tax dollars. Of all the provinces and territories, Nova Scotia, one of the country’s smallest provinces, had one of the most positive audit results. In his province’s individual audit, Auditor General Michael Pickup made only three recommendations for climate change management, including one proposal that the province update its more-than-decade-old risk ratings, which rank the severity of the risks of climate change. Revisiting its assessment would determine whether any risks, such as the threats to dikes or transportation infrastructure, had intensified, and what new mitigation measures are needed. Governments across the country now know where they have fallen short, but for Gelfand there has already been a valuable outcome. With nine provinces, the territories, and the federal government on board, legislative auditors across the country have had climate change top of mind for a year at least, maybe two. Where the individual auditors saw an exercise, she saw an opportunity to plant the seeds of awareness of climate change and sustainable development in auditors’ offices across the country. With few exceptions, most auditors make self-effacing jokes about how dull their work is, and it’s almost convincing. The truth is that their desk-bound toil, which would strike most as tedious, is almost heroic in its unflagging dedication to improve government efficacy on issues that unfold with great urgency on the ground. The dikes can be upgraded. Our emissions can go down. Storm sewers can be redesigned to handle more intense rainfall. Typical performance audits include recommendations for government, but this report didn’t. The auditors were passing the baton to legislators and to the public to push their governments for the answers. The front lines of climate change are not always dramatic. One late winter day on the Chignecto Isthmus, they look like a worn old failing dike scattered with cow patties and snow, with an eroding bank of Fudgsicle-brown marsh mud on one side and pasture on the other. Nearby is the town of Amherst, Nova Scotia, a town that’s doing all the right things to reduce its carbon footprint but still has the highest price to pay as rising sea levels threaten the dikes that are keeping its feet dry. Amherst’s handsome historic downtown seems weary relative to the thriving strip malls and chains on the town’s outskirts. Its heyday appears to have taken place two centuries back, around the time it was home to four fathers of Canadian Confederation. Victorian mansions still line its streets, but appearances are deceiving. Amherst was the first municipality in Nova Scotia to adopt LED street lights, and it hopes to become the province’s first testing ground for a next-generation renewable-energy grid. The library runs off geothermal energy, and the town is currently exploring ways to turn its stadium and sewage-treatment plant to net-zero energy. Amherst can’t seem to get around the sustainability curve fast enough. Talking to the town’s mayor, David Kogon, it’s easy to see why Nova Scotia, where every municipality, no matter how small, has its own climate change plan, has already hit its target. Before he was elected mayor, Kogon worked as an obstetrician gynecologist for nearly thirty years (his vanity plate reads “STORK1”) and what little spare time he had outside of work he spent with his family. He imagines most Canadians are in the same boat, trying to get by and living their lives without much awareness of the impacts of climate change. But with rising sea levels threatening to flood his town, urgency dawned. Kogon’s sturdy sense of conviction is invaluable, but his ability to team up and coordinate with the neighbouring town’s mayor, the county warden, and representatives at the provincial and federal levels to secure government resources for his community will be the deciding factor in how smoothly his town can adapt. His community, like countless others, is relying on all those recently audited government programs to operate at their best to provide the support he needs. Amherst may be a small town, but it’s far from on its own. Just outside of town, fifteen giant white Suzlon wind turbines stretch high into the sky, bright white against dark clouds. The winds that tear through the isthmus are powerful, and within the year, this wind farm will generate enough energy to power 10,000 homes. The turbines are mesmerizing, at once powerful and tranquil, the entire group of them spinning in near synchrony, to the blade. A previous version of the article incorrectly stated that, according to the 2017 federal climate change audit report, five out of nineteen federal departments had not fully assessed their climate change risks. In fact, the report noted that fourteen out of nineteen departments had not done so. The Walrus regrets this error. Mike Feehan is an illustrator, storyboard artist, and comic book artist from Newfoundland.